A new comic series, published by SORTED! organising & decluttering has just been launched. Created and written by bestselling author Lissanne Oliver, this series of 7 comics (available as PDF downloads), is aimed at children and teens. 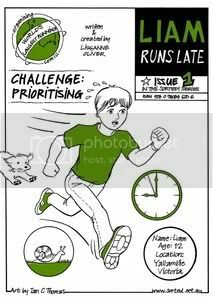 I was pleased to draw the first in the series, Liam Runs Late, about a 12 year old boy who has difficulty prioritising his time. This is exactly the kind of piece I enjoy drawing and is done in my most natural comic style, which isn't overly cartoony or very realistic, but a mix of both. I was also pleased to use hand-lettering, and it's made me question whether I should be reverting to doing that with other comics (particularly given that I've been digitally relettering some of my earlier pieces). All in all, a short comic that manages to be both entertaining and informative. I love drawing animals and kids, and believe in what the good people at SORTED! are working to achieve. It was fun working with Lissanne and this was a pleasure to draw.